There was a point on the bus ride to Bosnia when the nose of our vehicle turned inland, and the now-familiar glasslike swath of the Adriatic was lost to a landlocked series of craggy mountains. We weaved through tall, rocky hills dotted with shrubs; shocks of green grass covered the ground in between. 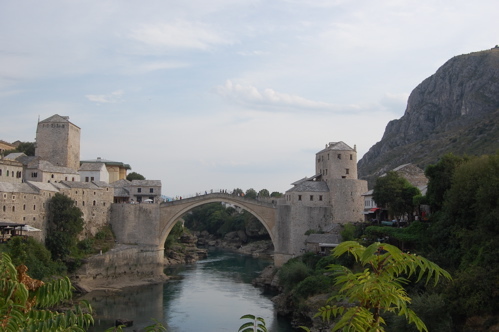 Suddenly, as if from the ether, the Neretva River appeared snaking between the hills, a radiant blue-green streak that we followed across the border, through towns composed of buildings stung by bullet holes, and straight into the bus terminal at Mostar. We would soon come to loathe that bus terminal. But we can talk about that later; I want you to see another side of Bosnia before that, to give you a better first impression. That said, I can’t leave out the fact that our initial footsteps in Mostar led us past two diaperless, begging babies; the quiet prosperity of seaside Split provided stark contrast to the sometimes tragic elements of life in Bosnia, whose streets are battle-scarred and haunted by ghosts. Ordering from the woman poised behind the counter, we asked for a plate of a little bit of everything, which sounded like the best way to get familiarized with the totally unfamiliar concept of Bosnian cuisine. I wasn’t disappointed: a bowl of salted peppers and cucumber slices stood in for a bread basket, and the entrée samples ran the gamut from stuffed grape leaves to stewed meats, from Ottoman-inspired to seriously Eastern European. (Somehow, a wild card slipped in too, in the form of a Spanish-style, tomato-laden chicken and rice dish.) Oh—and the desserts! Out on the patio, I snared forkfuls of baklava and Bosnia pie (cinnamony apples wrapped in phyllo dough), both laced with lemon zest. Citrus notes gave the pastries a fresh, light taste, belying the fact that they were drenched in honeyed syrup—but hey, that was okay with me. Honeyed syrup makes everything better, don’t you think? 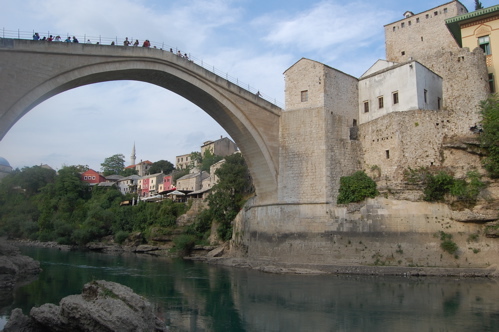 Mostar is blessed with natural good looks, too, split by the gorge encasing the Neretva and embraced by mountains. 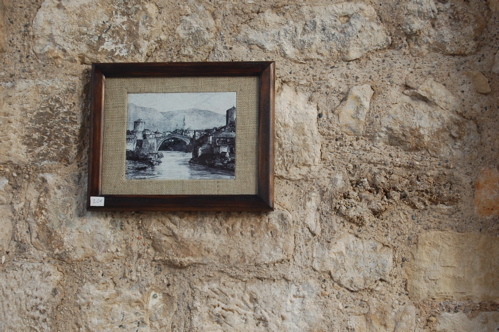 From the secluded courtyard of the town’s preeminent mosque—a testament to the influence of Ottoman rule—you can gaze out over the water and find an arresting vision placed against that background: Mostar’s Old Bridge. The arch is emblematic of the war, felled by bombs in the ’90s but erected again in 2004. Making our way from the scenic overlook to the bridge itself, we passed over cobblestone streets and through the territory of vendors hawking Ottoman-style tchotchkes and, as it turns out, absolutely terrible gelato. (Really, people. You have to try pretty hard to screw up gelato.) We clambered up the intricate but slippery stonework of the Old Bridge, utilizing every foothold that was offered, and then stood at the top to let the weight of it all settle in. We were in the eye of history, brutal and all-too-recent history, stuff that we grew up blissfully ignorant about but that our parents must’ve confronted in newspaper headlines every day. We posed lightheartedly, though, on the littler Kriva Cuprija, the Crooked Bridge, sat on rocks by the riverbank, and sipped the most delicious mochas that the Balkans had to offer. Then, finally—interrupted by errant cigarette smoke—we wandered in the dusk back to the bus station. 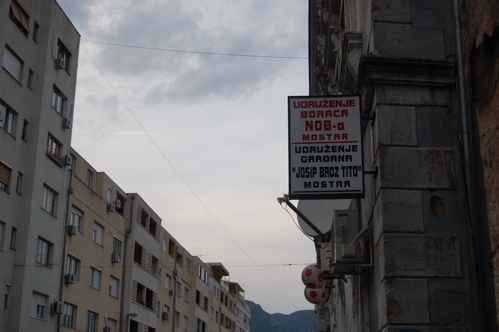 That meant passing bombed-out buildings on Mostar’s main drag, still encased by chicken-wire fencing and plastered with grave warning signs. 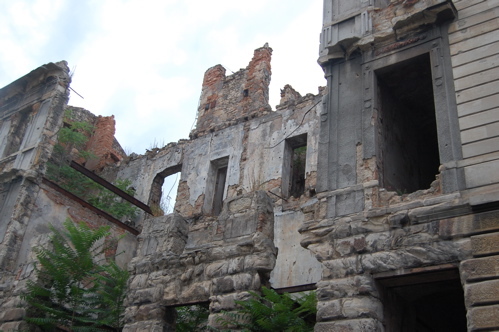 Trees grew straight through the ruins, no longer encumbered by man-made inconveniences like floors and ceilings. 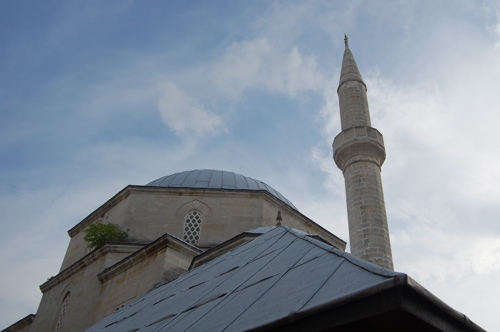 Although the official, printed bus schedule in Croatia had said we could return at 5:30 p.m., the cashier at the Bosnian station stated, very unsympathetically, that we were mistaken: the next bus came at midnight. So we waited out the arrival of the late bus, trying to find a nearby restaurant that served something better than menu items like “pizza (mayonnaise, cheese, and ketchup).” This, unfortunately, proved impossible. So the solitary pastry shop on Marsala Tita was like an oasis of good espresso, friendly patrons, and chocolate frosting, but optimism faded as the hours ticked by and our eyelids grew heavier. “This is a fiasco,” I grumbled after my second little square of cake, my second dose of caffeine, and my umpteenth inquiry about the time. “It’s not a fiasco,” Ted replied simply. “It’s Bosnia.” And I suppose he was right, even though things—frustratingly—didn’t quite work there, at least not in the way that I wanted them to. But that’s not why you go to Bosnia, at the end of the day. You go there to find the place where sorrow and hope intersect, where humans once played out their follies against a backdrop that will never change, no matter how many bombs we toss around. 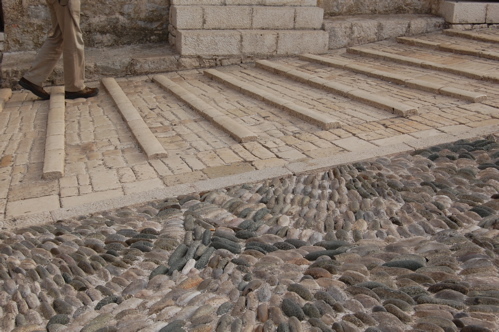 You go to see for yourself how a stone arch can make a once-divided town whole again.